For the last couple of days I have been rearranging the 2000 volumes in my library. Going through the shelves, taking one and putting it with its companions as to subject or concern is a kind homecoming among old and beloved friends. Some are much older than my 67 years. Another arrived this afternoon in the mail. Upon entering my new digs, people often question, “Have you read all these books?” “No, I say, explaining the collection are the guidebooks for my exploration of what it means to be human. There are few mathematics or accounting books, but many history, psychology, literature and religious studies. These members of my intellectual tribe travel on together. We set out on the journey almost 4 decades ago in Albertville, Alabama. There were many fewer then. Now we have moved into a office building, resting after five moves these past 36 years. I open one, reading my notes written in pencil (I have never been confident enough to write in ink) that are the marginalia of my life. Notes made in the margins. Scribbles marking my place in a book and the thought in my head. I looked a for a particular title and after a time my eye spied it, my hand reached and my eye remembered the cover. It is a modest volume, 9 by 5 inches and only an half inch thick. It’s title, “A Letter To A Man In The fire” by the late Reynolds Price. It’s subtitle are the two questions a young medical student asked Reynolds (who survived cancer though paraplegic). Jim Fox asked, “Does God exist and Does He Care?” What a question? Mr. Price then wrote Jim a letter of 86 pages honestly speaking to those questions with the kind of honestly a cancer survivor owes a cancer patient. He spoke of faith, not the easy recitation of empty platitudes or even the unthinking repetition of ancient holy writ. No, he struggled to say that he did believe that God does exist and that somehow in the mix of chance and circumstance where the innocent are afflicted and the rain falls on the just and the unjust. He then says the things that has resonated in my soul ever since the day I first read this letter. Now, let me stop. I know its unfair. But please believe me that I have a good reason. We shall here again, please be patient with me. I moved to Mississippi in 1989 to take up the rectorate of The Chapel of the Cross in Madison. The Chapel was an ancient (1848) Gothic revival treasure that by the late 20th century was filling with the new suburbs of Jackson. I took up and took to my task at hand. In those first days the community numbered around 125 souls. We had the elegant church, a five room sharecropper house served as as everything else save too rundown single-wide trailers that served as educational space. The place began to grow. Over the next decade the place grew rapidly. I imagined it was like driving a bus with no brakes. Careening down the road and every time I risked a glanced over my shoulder the bus was longer and packed to the gunnels with more people. By the end of the decade the community was nigh 900. I celebrated Eucharist 4 times on Sundays, taught, opened and closed. This went on for years until I was almost used up. In 1998 I was rescued. The Vestry instructed me to find a priest for the team. So I did. The Reverend Doctor David Christian come onboard and we moved to 6 masses on Sundays: 7:30, 8:45, 11:00 & 5:00. The middle two were doubled: a mass in the church and one in the parish hall (now named for David). He and I waited until the two processions were ready to move. Then and only then did we decide which one of would go to which service. David went to seminary from a medical practice. He, his wife and two kids moved from Jackson MS to the General Seminary of the Episcopal in New York City. He after his first academic year he did Clinical Pastoral Education at a city hospital, working as a chaplain, learning the ropes of institutional ministry and learning about himself in the work of a priest. That hospital routinely gave each person who came on staff in any capacity a physical. David’s physical revealed that he had a very serious non-symptomatic cancer in one lung. The only thing to do was remove one entire lung. They did that very thing leaving David with one lung and a very tenuous diagnosis. To everyone’s amazement. David lived, finished his last two years of seminary and returned to Mississippi. He told me once that he believed that he survived because he was so thrilled and happy with what he was doing that it pumped his immune system. I don’t doubt it. Upon returning to Mississippi, David was assigned to the parish in Bovina, MS. Only behind the Magnolia Curtain would a town be named for the genera of medium to large-sized ungulates! I was delighted to have such a gifted fellow as a colleague and so we were off to the races. Honestly, I don’t recall how long we lived in Eden together. I do remember that David was cancer free for at least a decade and even was cleared to buy life insurance. But one day he went into town for his routine physical. There was cancer in his remaining lung! Gobsmacked out of denial the parish and greater community sank into depression. Introverted by nature, my friend David turned deep inside to process this news. Reluctant to intrude his contemplation, I resisted giving him, A Letter to A Man in the Fire, though that was my first thought. A few days passed. A knock at my office door, “Come in.” It was David. “Sit,” I invited.” He continued to stand in the door. “On my way to my doctor’s appointment I stopped by Lemuria (the world-class book store in Jackson) and having a little continuing education money left, bought a book.” From behind his back he produced a thin beige volume, “A Letter to a Man in the Fire.” “Would you believe that I have a copy of that book for you, synchronism, huh?” “At least,” he said, “I was afraid to read it for several days.” “Now you have, I asked?” Nodding, he opened the book and begin to read, framed in the door. My bred-in-the-bone conviction about you is that you’re bound toward a goodness you can’t avoid and that the amount of calendar time which lies between you and that destination is literally meaningless to God, though surely of the greatest importance to you. That was the very passage I wanted to show him. He closed the book, looked at me, saying nothing. Our gazes met for a few seconds. He closed the door and went down the hall. We never spoke of the book again. He soldiered on. So did I. I was not wise enough to realize that while the cancer diagnosis predicted that David would not die an old man, it also marked the beginning of the end of my work in that place. Used up, I sank into a deep depression and in 2001 was hospitalized for eleven weeks. I resigned by years end. The end of the story did not come immediately. David continued his ministry at the Chapel. Chemotherapy staved off the killing blow but prevented him prospering. He spent a long of time meditating, praying in his office behind a closed door. I moved to Memphis, TN as interim rector for Saint John’s Parish in 2002. At mid-year in 2003, I was called to become the sixth Rector the Parish and continued in that job until February first of this year. I was not there when the end came. In early Summer of 2005 after celebrating the early Eucharist at the Chapel of the Cross, he retired to his office for quite a long time. Then he phoned his beloved wife, Frances, and asked her to come for him. They drove to the hospital and he died a day or two later. The books on my shelves are my old friends. There are stories in pencil on many of their margins. They traveled with me as they instructed me for my work on the journey. One day they will go with someone else, but for now, we continue our work together. I live in hope, in spite of the facts. “How is retirement?” “It’s going very well, strange but fine,” is my usual reply. A common line is you look like you have really lost some weight?” After the third time, I latched onto, what is now, a standard response, “Oh, I am at least a thousand people lighter.” My cardiologist was thrilled that I had retired. All the numbers speak to my body being thrilled as well. Sleeping in on Sunday, an activity known in Alabama as “attending Bed-springs Baptist” has aroused no guilt. We did make it to Easter Day, let the record show. I have devoted a lot of time getting my new office up and running. The car no longer automatically heads west from Shepherd Lane. Now it heads East instead, which is the direction of enlightenment. Now what? After a very helpful pep talk from an old and valued friend, this is now my practice. Most days, I drive to 1049 Cresthaven Road, Memphis, TN 38119 and there I go to work. What is my work? At present, I’m diving deeper into Bowen Theory than I have ever done before. The Triangle is the object of my quest. I shall understand that little beast if God is gracious. The Triangle is the basic molecule of relationships. It consists of three people or two people and an issue. Triangles are also very fluid moving such that two points are in and one is out. But suppose, one wanted to grow oneself up, while calming oneself down? What if one decided to take maximum responsibility for ones own self, focusing on one own functioning? Bowen called that Differentiation or more precisely, taking up the work of “Differentiating a Self.” Trust me if you should truly entertain such a notion for even half a day, everyone in the primary triangles you inhabit will know. In addition, if you should take up this “self to differ” the reaction will be progressive and predictable. Hell hath no fury like you arouse when you fool with someone’s heirloom triangle! Some of them have been around for eons. Remember, when someone leaves or dies, people are standing line to take the vacancy. This is the view as I write, not bad. How is retirement? Well, I’m lighter, but not sure what else, just now… I live in hope, in spite of the facts. What I hope ALL Christians Learn by Following Jesus. • Judge not! I mean literally mean, Judge not at all. • Journaling is essential if you mean to grow in soul. • Tithing as a way of life. • It’s hard to go back to plowing when you just ate your ox! Three classes: Those who see, Those who see when shown, Those who do not see. Participation is not a choice. Life always reacts to directives, it never obeys them. We do not see “reality” – we each create our own interpretation of what is real. To create better health in a living system, connect it to more of itself. Black hole warping space-time, computer artwork. We live inside a box formed by time & space. Standing at the edge of that reality, peering beyond, we see, as the Apostle wrote, through a glass darkly and our mind fills with haze and vapor. We just can’t go there as nothing inside compares with the outside (so far as we know). Carl Jung posits the need for a point of reference outside the conditions of present reality. We need two things to make sense of anything and everything. 1. What we must have then, is a point of reference beyond the time & space container in which we live. 2. And that reference point will be experienced through matter which is the only way we know how to know anything. Before the foundation of the world, The Holy Trinity promulgated the incarnation. The Second Person of the Trinity, coming from eternity into time and space fully material to promulgate salvation. Matter impacts meaning and Divine matter imparts ultimate meaning. The Christ-child is born and laid in a manager because there was no room for them in the inn. Like the birth of this child the origin of this son of God is outside the inn of the world and laid in a MANGER. Noah’s Ark floated in the waters of the deep carrying the pioneers of the restored the world. Noah believed God, built the ark, filled it with beasts, went aboard and God, it says, Closed the day. Moses, in his ark, floated out of the bulrushes into the life of Pharaoh’s daughter. The Ark of the Covenant – The box containing the Law – through the desert toward the promised land. The manger in the Bethlehem stable. The Ark/Manger: This Kigotos is a sign of Christ coming as servant as well as a king. The manger signifies emptiness that is to be filled. The container available and waiting to be filled with the precious gift of God, the gift of the Son. In this box, we live in time and space. To this ark, this Manger of time and space, is born a material reference point: Jesus the Christ. Now, let me string together reflections by the Church Father on this great night. On a humorous aside. Last night (Christmas Eve) at the family service performed the traditional Christmas Pageant. Children were dressed as all the usual suspects. I did have to intervene when one little girl announced she wanted to be a pig at the manager scene. “No pigs,” I pronounced! Even though Memphians revere all things porcine, especially in its myriad of eatable forms, there was still no pig at the manager. Luke ends the nativity gospel in fields near Bethlehem where the angel of the Lord proclaims, this day is born to you a savior who is Christ, The Lord, Savior = God’s activity come to earth, Christ/Messiah/the anointed one, the Lord, the prince of peace. So there you have it. The story that begins this night with this Mass in the mid-night, ends on Easter Eve after the fall of darkness, but in that darkness has come a great light. A latter day Church Father, C.S. Lewis, once wrote, “What a terrible place the world would be if it were always winter and never Christmas.” Unfortunately there is not much winter (70 degrees but thank God for 30 ton air-conditioners) but it is Christmass! We are not alone, the Christ Child, the only Son of God, has come to be born in us. To Him be honor and glory now and forever. Amen. 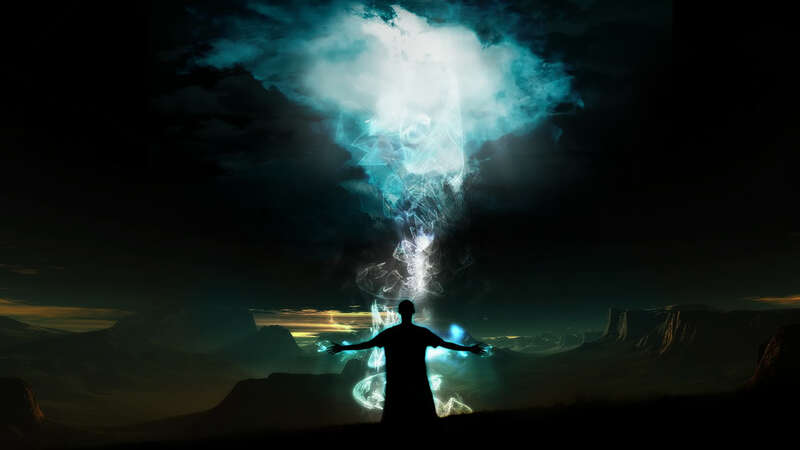 The magician is the archetype of the shape-changer, the protean power of men to move mountains, to adjust to changed conditions, to find a way to make things work. As Sophocles noted twenty-five hundreds ago, “How numberless are the world’s wonders/And none more wonderful than man.” He who tamed the salt-churned seas, who built roads across the mountains, who wrenched from the recesses of his soul the Fifth Symphony, is the wonder-worker in nature. His shadow side, though, is control, manipulation, sleight of hand and charlatanry. He is not to be trusted. He embodies the ethical edge along which all men walk, the fine line between working wonders and treating the world as a shell game.